Flash Remoting has been getting a lot of attention from developers in recent months. But what is it and why should we care? In a nutshell, Flash Remoting is a way to let Flash applications on your computer ( i.e. in a browser such as Internet Explorer and Firefox or an AIR desktop application) communicate directly with a website. It’s fast and powerful and opens up new worlds of possibilities for RIAs (rich internet applications). This means that web developers can now create complex, interactive applications that you access on the Internet but look, feel and have all the sophistication and functions that you would expect from a desktop program like Microsoft Word. OK, that’s not really a nutshell. Show me what you mean! A simple example of an RIA is the Google Maps API for Flash. They provide an SDK (software development kit) for Flash which simplifies the process of retrieving map information from the Google Maps API (application programming interface). Now, Flash developers can write customised Flash applications that communicate directly with Google Maps and get map data stored on their databases. I created a simple demo which I posted on this blog earlier: Google Maps API. Another example is eBay who have already published a desktop RIA of their auction website which communicates directly with eBay’s API (application programming interface) to provide a much slicker, faster, feature rich experience. So what does this mean for e-learning? This opens up a whole new world of possibilities for integrating Flash with learning management systems and information services. Flash will be able to directly use databases and rich media to create fast, efficient interactive multimedia applications for learners, course content developers and teachers. Many of the processes can be automated and made to be re-usable therefore cutting down on development time and costs. In the not too distant future, we’ll see advanced learning interactions that can incorporate web services from Flickr, YouTube, Facebook, Skype, eBay, Google Web Services including Google Talk, Amazon Web Services… and the list is growing. We’ll see images, audio, video and animations being used more dynamically and with increasing complexity to provide truly amazing immersive learning experiences. We can look forward to collaborating with classmates and teachers in virtual environments and interacting with text, images, audio, video, realtime 3D objects and animation. The possibilities are endless! As well as being faster, Flash Remoting has other benefits too. The traditional XML file based approach to send lesson data, i.e. questions, answers, texts, settings, etc. has a very serious drawback – browsers store lesson data in learners’ browser caches* which can be easily retrieved by learners so they’ll be able to read ALL the learning activity data. Even with the commonly adopted SCORM standard, this is still the case. Not very good if it’s a test or exam that gives learners credits or final grades! With Flash remoting, however, the data is loaded directly into Flash Player’s memory and is very difficult to access. * Browsers, i.e. Internet Explorer, Firefox, Opera, etc. store files downloaded from websites in a special directory called a browser cache. If you return to a particular web-page, the browser checks to see if it still has a copy of any files downloaded in its cache and if it does, it simply uses that one and doesn’t download it from the website. It’s a good idea because it means your web browser has less data to download and your browsing experience will be faster.It is supposedly possible to tell browsers not to use cached files for certain pages but the standard is different across different browsers and in many cases it doesn’t work either! 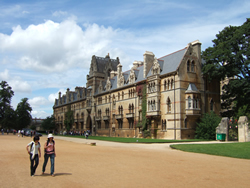 Oxford University Press is the biggest university press in the world (Cambridge University Press is the second). It publishes an impressive catalogue of EFL/ESL course books that are used is academies, schools and universities and by individuals around the globe. Over the last year or so they’ve been very busy creating a complementary set of on-line resources to accompany their course books. I think OUP have made a very astute move, in marketing terms, by providing these resources. As you most probably already know, there’s already a plethora of free on-line EFL/ESL resources for students and teachers on the web, some of them high quality, especially on the BBC’s Learning English website and some of them not so high quality. The major drawback of most on-line resources is that they don’t always correspond very closely to what learners are learning at any particular time – they may cover a particular grammar point but the vocabulary and context may be completely different or they might cover vocabulary but in differently organised lexical groups, for example. OUP have addressed this problem quite admirably by providing on-line resources that correspond to specific books that they publish, such as New English File, Natural English and New Headway, unit by unit, topic by topic. Now it’s a case of learners looking up the website addresses printed on their course books and finding the appropriate chapter and language point that they want to practise. But no learner accounts or records! However, one drawback, that I can see, is that learners can’t easily keep track of their activities or progress. They can’t even tell if they’ve already done an activity or not, unless they make a note of it somewhere and keep it for reference. I think it’s an important part of promoting learner independence for learners to have access to records of their activities and reports of their attendance and progress. It can be very motivating and useful as a self-diagnostic tool. I can see why this is, I don’t think OUP want to commit themselves to the administration overhead of maintaining a student login and records database system. That would be a huge project that might even rival the world’s largest learning management system at the UK’s Open University which accommodates nearly 200,000 students. They’re definitely a good idea. Overall, I think OUP’s EFL/ESL on-line resources are a useful addition to their publications and address the growing expectation from learners that some part of their studies should incorporate e-learning, and I think other publishers are likely to follow their example. The OUP’s on-line resources are accessible to everyone, without registration and they’re free of charge. Papervision3D is a 3D graphics engine for Flash. It allows you to create 3D objects and environments and manipulate them in real-time in Flash. You can easily create complex 3D objects and environments in your favourite 3D authoring software and export them as COLLADA files, or download 3rd party COLLADA files for Flash to use. The example below is a 3D interactive globe. It’s simply a bitmap image of the earth wrapped around a sphere, so don’t expect Google Earth! Feel free to play with it and leave any comments. Please note that the image file may take a few seconds to download, depending on your internet connection. I’ve been playing around with Google Maps API for Flash. I’ve maintained all the usual controls that we expect from Google maps and I’ve added a search bar which accesses Google’s Geocode web service to convert addresses into latitude and longitude coordinates and then find those locations on the map. Of course, it would be relatively easy to add a list of addresses either from an external XML data file or by accessing a custom database, so that users can quickly and easily find specific addresses without having to search for them themselves. One advantage of Flash over regular web pages is that we can use full screen mode, whereby Flash Player takes over the entire user’s screen. Ideal for map-reading. Click on the “Full Screen Off” button on the bottom right to enter/exit full screen mode. Please note that in full screen mode, Flash Player disables the majority of keyboard input. You can also exit full screen mode by pressing the escape key. Thank you for your contribution to my work.